Initially for convert the log files of my Royaltek RBT-3000, this little program allows you to read the NMEA sentences, and the tracks from CartoExploreur and OziExplorer. PCX5 track (.trk). For use with CartoExploreur, for example. Text file with tabulations (.txt). LCV is a file format for storing tracks, without loss of information. 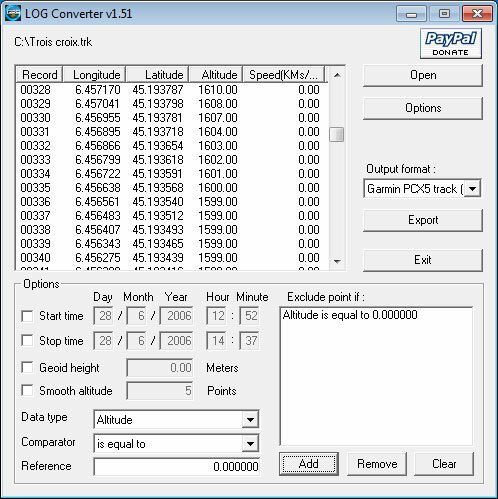 Ability to filter waypoints based on various parameters (date, altitude, speed...). In the list of waypoints, double click on an item number displays an information window. A right click displays a menu of options. 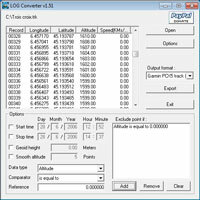 LOG Converter is free, try it now ! !